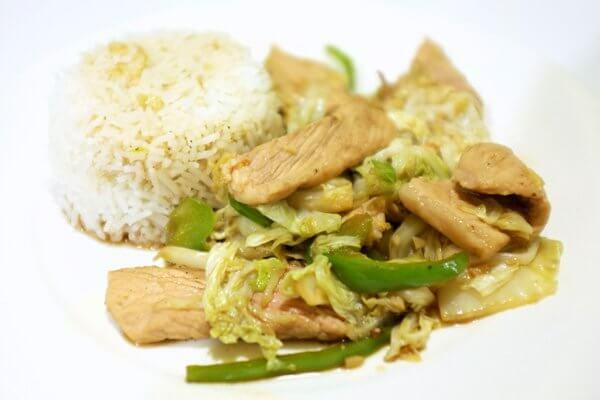 This is a very simple but extremely delicious stir fry. It has few ingredients, but packs quite a punch. It features napa cabbage, a Chinese cabbage in the same family as bok choy. I had green bell pepper on hand, so I used that instead of the red pepper in the recipe. I also had pork chops, so I used that instead of the pork tenderloin. The flavouring of the stir fry comes from a combination of hoisin sauce, soy sauce and balsamic vinegar (most likely a convenient substitution for Chinese black vinegar). Served with white rice, this makes a great weekday meal, and delicious leftovers.